Wild blueberries add a burst of flavor, colour, and nutrients to a traditional holiday brunch that guests will find unforgettable. 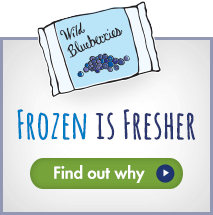 A new study, published in Food & Function suggests that consuming a flavonoid-rich wild blueberry beverage may enhance executive function in 7- to 10-year-old children. Ready for a fabulous feast? Here are six wild blueberry dishes that will put your table on trend. If you're lucky enough to be in the Maritimes, Quebec or Maine during the wild blueberry harvest season, hopefully you've been able to find the fresh, tiny berries for sale at a nearby farm stand or market. Christine will be in St. John’s, Newfoundland from Wednesday June 7 - 11 and is available for in-studio segments to do cooking demonstrations and to share her knowledge and love of wild blueberries and their numerous health benefits.